After reading on life magazine about Personal Trainers, Motivators, Life Coaches, … After seeing cars and motorbikes with more then 150 kw… After many thing, Sballato Team decides to get kick off at new revolutionary hi-tech products: iGnorante® , the àiPod Demotivator. 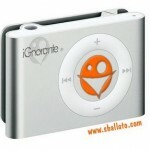 iGnorante® is a similir iPod mp3 reader to offend themselves. 1GB of memory and thousands of new demotivant phrases downloadable online. All insults available are browsered by level, type and category. iGnorante® hasn’t Pause button. Every time you play an insult you must ear it entirely. If you want, pressing for 5 seconds Play button (the smile) you can start a unendable loop of 10 offences.